Throughout the year, as work from the Pintupi painters of Kintore and Kiwirrkurra, is brought along the dusty outback roads into town, their company, Papunya Tula Artists, sets aside some of the best. They draw on these works to hang the annual Pintupi show, which opened in their Todd Mall gallery on Friday night. 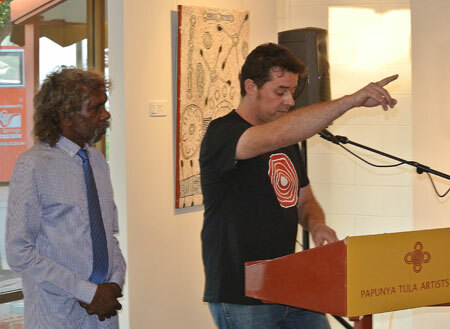 Left: Matthew Tjapangarti, chairman of the Papunya Tula board, and Ben Danks, assistant manager, at Friday’s opening. Despite all the challenges the artists may face – from the downturn in the art market to the ravages of kidney disease – they continue to paint their Western Desert country with vitality, vision and finesse. In so doing they sustain their company, now more than four decades old, as a profitable enterprise requiring no external support. Guest speaker at Friday’s opening was the recently appointed (since May) director of Museum and Art Gallery of the Northern Territory, Marcus Schutenko. He modestly ceded MAGNT’s key message for the night to its curator of Aboriginal art and material culture, Luke Scholes. 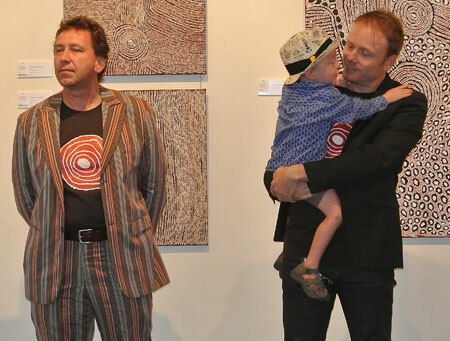 Right: Marcus Schutenko (left) and Luke Scholes with his son. Behind them, the work of Nanyuma Napangati. For the past year Scholes has been working with a curatorial team of Western Desert artists, including Long Jack Phillipus Tjakamarra, one of movement’s founding artists, to develop a major exhibition drawing on MAGNT’s collection of early Papunya works. Scheduled to open in 2017, the exhibition will be the first public viewing of nearly 100 paintings, rare cultural artefacts and historical ephemera, from, in Scholes’s words, that “moment in time that changed the course of Australian art forever”. This was back in 1972 at Papunya when “an extraordinary collective of men from a number of different language groups” took the decision to paint the Dreamings of their country on whatever materials they could find and send these works out into the world. MAGNT’s is the largest collection of early Papunya art in the world – more than 200 boards, some of them “restricted” because of their secret-sacred content – amassed with foresight by Dr Colin Jack-Hinton, the museum’s founding director, and followed by dozens of further acquisitions during the 1970s. Left: Bobby West Tjupurrula, artist, former chairman, and a member of the curatorial team, with his niece outside the gallery on Friday. 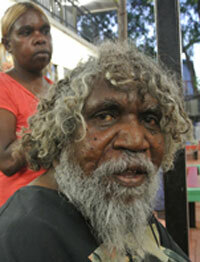 Other members are Michael Nelson Tjakamarra, Joseph Jurra Tjapaltjarri, and Sid Anderson. The curatorial team have conducted exhaustive research and consultation in preparation for the exhibition: “It will finally reveal a collection shrouded in mystery, controversy and intrigue for over 40 years,” said Scholes. Below: The annual show always features a large work on the gallery’s rear wall. This year it is a historic work, a 1999 collaboration by eight male artists who donated it to auction to raise funds for kidney disease treatment. The money went towards the establishment of Western Desert Dialysis and the very successful Purple House. The striking smaller works on the wall at left in the photo are by Willy Tjungurrayi from Kintore.